While this movie pretty much ignores the history, it's still a good movie, great CGI, good acting and the ending implies a sequel. Many have commented that Vlad was not a good guy in real life, hence the historical figures title of the "impaler". The movie does show this in a few scenes but in a interesting if somewhat brief way. Good action scenes, battles and some gory images, but then as it's Dracula, what do you expect. 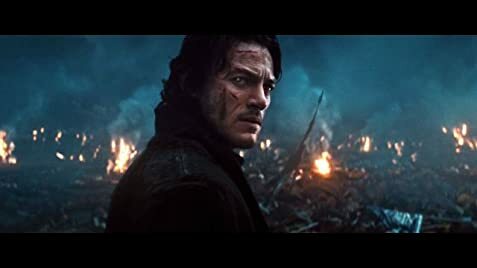 If your looking for a movie to just sit back and have fun watching, Dracula Untold is an enjoyable romp with good actors, Charles Dance is impeccable as always and Luke Evans is good as the main character. The location of the market at the end: front of the St Andrew Undershaft church, St Mary Axe street, London but there is no market there in real life. Master Vampire: What is it that you are seeking? Vlad: I want the power to destroy my enemies and save my family. While in the armory in the monastery Vlad walks through a beam of light and doesn't burn.